Rémi Jouty, «ingénieur général des Ponts, des Eaux et des Forêts», took over as Director of the BEA on 1st January 2014. 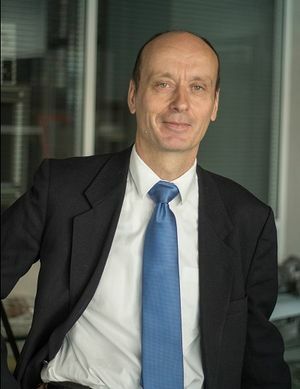 Rémi Jouty began his career in aeronautical research at the Direction Générale de l’Armement (DGA) where he managed the programmes on aerodynamic and flight dynamics from 1987 to 1995. From 1995 to 2006, he dedicated himself to aviation safety at the Direction Générale de l’Aviation Civile (DGAC) in the SFACT (the Service de la Formation Aéronautique et du Contrôle Technique, which became the Direction du Contrôle de la Sécurité in 2005). He oversaw all activities related to certification and continuing airworthiness of French-designed or registered public transport aircraft. In a European context, he ran the international teams responsible for the A330 and A340, then the definition of the certification conditions for the A380. He organised the gradual transfer of type certification activities for transport aeroplanes and helicopters to the European Aviation Safety Agency (EASA) and implemented the new European regulation on aircraft maintenance, the issuing and continuation of individual airworthiness. DSAC (Direction de la Sécurité de l’Aviation Civile), the DGAC’s oversight authority with 1,300 staff. While there , he oversaw the process of risk evaluation and reduction. Married with two children, Rémi Jouty is a graduate of the Ecole Polytechnique and of the Ecole Nationale de l’Aéronautique et de l’Espace (ENSAE). Rémi Jouty has been gliding and has performed over 1,000 flying hours on twin-engine aeroplanes, in IFR conditions.